If you have missing teeth, Dr. Grant Olson can restore both function and appearance with dental implants. An alternative to traditional tooth restoration options, dental implants can offer a more permanent and natural solution to enhance your smile and improve chewing and speaking. Unlike conventional crowns, bridges, and dentures, dental implants are supported by a titanium post placed into the bone, making them a permanent part of your mouth and mimicking your natural teeth in the way they look and feel. They do not move or slip along the gumline, and they require no extra maintenance beyond regular brushing and flossing. 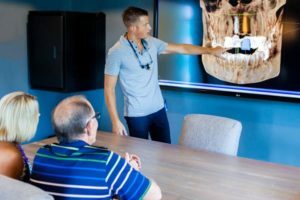 These innovative solutions for replacing missing teeth have been revolutionary in the restorative dentistry field, and Dr. Olson is proud to offer them to our patients here in Springfield. Innovative Dental did my implants and they are amazing!!! Extremely impressed. To learn more about dental implants, we invite you to view the detailed sections below, or contact Innovative Dental today to schedule an appointment. What Are the Different Types of Dental Implant Solutions? Single-Tooth Implants – Designed to replace individual teeth, this implant option consists of a single implant post capped with a custom dental crown. This restoration is often a good choice if you are missing one tooth or have multiple missing teeth that are not adjacent to one another. Implant Bridges – If you have two or more consecutive missing or damaged teeth, an implant bridge may be an excellent solution. With this option, a customized dental bridge is held in place by at least two dental implants, making it much more secure than traditional bridges that are supported by natural teeth. Implant Supported Dentures – Also called implant dentures or implant anchored dentures, this full arch restoration can be a great alternative to removable dentures. Generally secured by four to six implant posts, implant supported dentures can provide exceptional strength and stability when replacing a complete row of teeth. At the time of your consultation, Dr. Olson will perform an extensive evaluation to determine if dental implants are right for you. In some cases, preliminary procedures—such as scaling and root planing for gum disease—can be employed prior to implant surgery in order to improve candidacy and increase the likelihood of treatment success. Our team will discuss all options available in full detail, ultimately helping you decide on the most appropriate course of action for your tooth replacement needs and goals. At Innovative Dental, we offer advanced surgically guided dental implant techniques to ensure the best possible results. Dr. Olson will begin the implant treatment process by meeting with you for a thorough consultation to assess your jaw and gums, and go over your expectations. 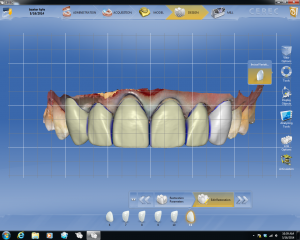 If it is determined that you are a candidate for dental implants, he will use a special 3D imaging system to create a meticulously detailed view of your oral anatomy. This will help him plan the implant placement with extraordinary precision, allowing for the most comfortable and natural fit possible. At the time of surgery, Dr. Olson will place a small, strong titanium post under the gums in the area of your missing tooth. This post is designed to integrate into the jaw and act like your natural tooth root. In about three to six months, the implant should completely fuse to the jawbone in a process called osseointegration. Many times, Dr. Olson can place a temporary crown over the implant during this process. Once the implant has fused to the bone, he will affix a custom-made, permanent crown on the implant, and the procedure is complete. Your new tooth should both look and feel like a natural part of your mouth. Once fused to the jawbone, dental implant posts typically become a permanent part of the mouth. The crown, bridge, or denture secured to the implant(s) usually lasts several years—sometimes even decades—before potentially needing replacement. It is important to note that the longevity of dental implants can be impacted by oral hygiene, so brushing, flossing, and receiving professional dental cleanings on a routine basis are vital to helping prolong the lifespan of your restoration(s). When considering dental implants, it is critical to keep in mind that pricing is often an indication of the training and experience of a dentist, the quality of materials and technology they use, and the success they’ve had in achieving excellent results. For these reasons, a “low cost” should never be the sole reason for choosing a particular dental implant provider. If you are interested in dental implants but concerned about the overall expense, our practice partners with several healthcare lenders to offer dental financing options that fit virtually any budget. During your visit, a member of our team will be happy to get you started on the application process for the plan of your choice. Once you have received word on approval—which typically happens within minutes—we can move forward with scheduling treatment as soon as you wish. For more information about dental implants, or if you would like to meet with Dr. Olson for a one-on-one consultation that includes a complimentary 3D scan, please contact us today.